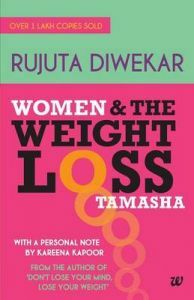 This is a health and nutrition book from bestselling author Rujuta Diwekar. Bring back the tone in your body, the glow on your face and the sense in your head. Stop the weight loss tamasha. The nutritionist who taught us that simply eating (pun intended) is the key to a fab body is back with a comprehensive book on women, food and everything in between. From puberty to marriage, from pregnancy to menopause, Rujuta explains in detail the changes women go through (and God knows as Indian women we go through way beyond just hormonal - husband, in-laws, children, career, maid, etc.) and how what we do (or don't) during these phases affects our overall well-being. Building on her four principles of eating right from "Don't Lose Your Mind, Lose Your Weight", she goes on to share her four strategies (Nutrition, Exercise, Sleep and Relationships) for each of these phases and especially the lifestyle disorders of PCOD, hypothyroid and diabetes. Rujuta, in her usual indomitable style, debunks (rubbishes rather) myths related to food, hormones and workouts, forces us to rethink our belief that pregnancy, menopause, hypothyroid, etc, come in the way of losing weight and reveals just how easy it is to remain healthy, strong and fit through one's life. How different is this book from her first one. This book is different from her first in several ways. First, she concentrates solely on women as her subject. She covers issues and diet predicaments that are specific to women. She gives very specific advice on what girls/women can do to remain healthy/strong in each phase of their life. Her chapter on lifestyle disorders is extensive as we now know, PCOD and hypothyroid have become rampant ("Outlook" is currently doing a story on endocrine disorders) and there is no information out there for Indian women on why these disorders affect us and how simple changes in diet, exercise can make such a difference. While in "Don't Lose Your Mind" Rujuta spoke about the four principles of eating, here she moves on to explaining her four strategies for a healthy lifestyle. She moves beyond food to also cover exercise, sleep (again, a crucial aspect to health which is not spoken about) and relationships. Rujuta Diwekar works out of Mumbai, practises yoga in Rishikesh, ideates in Uttarkashi and treks in the rest of the Indian Himalayas. Winner of the Nutrition Award 2010 from Asian Institute of Gastroenterology, she is amongst the most qualified and sought-after practitioners in India today and the only nutritionist to have accreditation from Sports Dietitians, Australia. Her first book has sold over two lakh copies in four languages and is still in national bestseller lists, more than a hundred weeks after its debut. In the plethora of diet fads and fears, Rujuta's voice rings loud and clear, urging us to use our common sense and un-complicate the act of eating. With over a decade of experience working with people from all walks of life, including Kareena Kapoor, Anil Ambani, Preity Zinta, Karishma Kapoor, Saif Ali Khan and Konkona Sen Sharma, she has fine-tuned her methods to the real issues facing urban Indians.